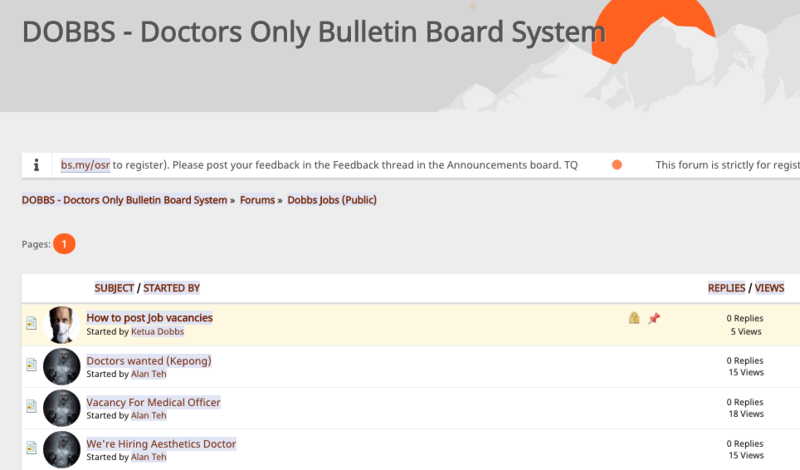 Our Doctors Only Bulletin Board System (DOBBS, founded in 2000) for years has started off and has been maintained as a web board/forum. The current version, hosted at https://forum.mydobbs.net is due for a refresh. Registered DOBBS members are invited to test out the Beta forum and announcements have been made in our existing Dobbs web forum, Dobbs Facebook group and Dobbs Telegram to this effect. Registered users can post vacancies there. Posts from the Dobbs Job Facebook group will also be mirrored here. Others may use https://dobbs.my/submitjob in order to submit a vacancy and approved posts will be published in the new Job Board.